Shop T-Shirt Laundry online at TShirtLaundry.com where the T-Shirts are inspired by anything and everything – jokes, Youtube videos, their favorite TV shows and movies, current events, and more! 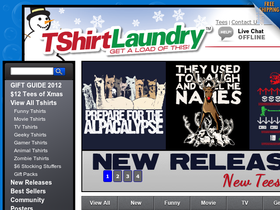 T-Shirt Laundry carries funny, dirty, pop culture, geeky, entertaining, graphic, outdoorsy & custom T-Shirts. Save on your next purchase from TShirtLaundry.com with discounts, coupons, promotions and savings from 58coupons.com. Sign up for TShirtLaundry's email and receive 20% off your first order. Click link for details. Head on over to T-Shirt Laundry for some really unique T-Shirts starting at only $16.00. Click link to view. Want to design your own T-Shirt? At T-Shirt Laundry they welcome custom designs and only charge $18 to make it for you. Click link for details. Hurry on over to T-Shirt Laundry for all your tees at only $10 with this coupon code. Click link for selection.